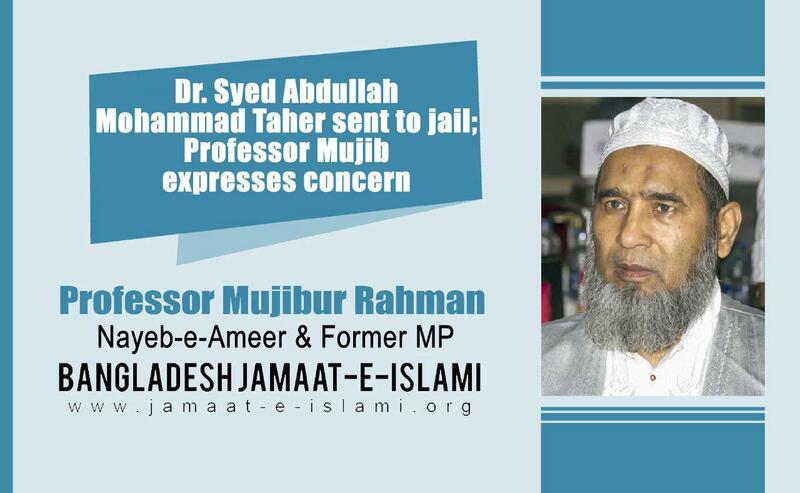 Nayeb-e-Ameer of Bangladesh Jamaat-e-Islami and former lawmaker Professor Mujibur Rahman has issued the following statement on 20 March 2019 expressing deep concern as the central executive committee member of Jamaat-e-Islami and former Parliament member Dr. Syed Abdullah Mohammad Taher has been sent to jail today in connection with a government sponsored false case. “I am expressing my concern as Dr. Syed Abdullah Mohammad Taher has been sent to jail today in connection with a false case. Dr. Syed Abdullah Mohammad Taher has been suffering from many diseases for years. His kidney was transplanted in 2017. The government lodged this false case in 2015 in a bid to harass him politically. The government has sent him to jail as a part of their strategy to imprison the opponent political leaders. We are deeply shocked and saddened by this incident.